Japan's lower house has today approved laws that would allow the country's armed forces to fight abroad, despite broad political opposition and large street protests. The controversial legislation to allow an expanded role for the nation's military was approved in a Thursday vote that was boycotted by the opposition. This result came one day after Prime Minster Shinzo Abe's ruling bloc forced the bills through a special committee despite intensifying protests. Opposition lawmakers walked out after their party leaders made final speeches against the bills. Outside on Tokyo's streets, as many as 60,000 gathered in the rain to demonstrate their opposition, according to organizers the Students Emergency Action for Liberal Democracy, who say that they see this legislation as a sign that the political situation in the country is deteriorating. 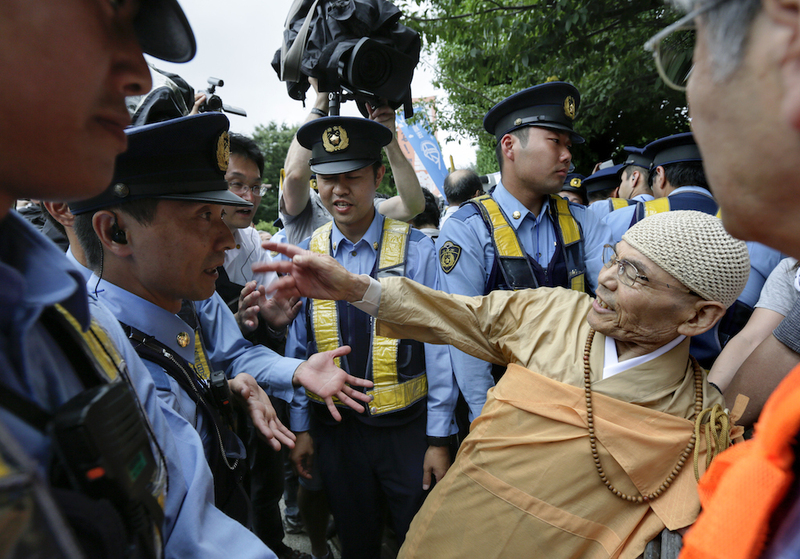 Japanese policemen remove a Buddhist demonstrator protesting against security bills outside Japan's parliament in Tokyo on July 16. Photo by Kimimasa Mayama. Abe wants to strengthen the military's role to counter China's growing presence in the region and contribute more to international peacekeeping efforts. "The security situation surrounding Japan is increasingly severe," he told reporters after the vote, adding: "These bills are necessary to protect Japanese people's lives and prevent a war before it breaks out." The legislation was crafted after his cabinet last year adopted a new interpretation of Japan's pacifist constitution, which was drafted by the US and has been in place since a year after the end of World War II. The constitution opens by saying that the Japanese people have "resolved that never again shall we be visited with the horrors of war through the action of government." Opponents of the changes, including lawmakers, legal experts, and academics, counter that the new interpretation is unconstitutional and say that it could undermine 70 years of pacifism. Polls show that about 80 percent of Japanese find the bills objectionable, and the majority of them say they think the legislation is unconstitutional. "Opposition to the bill is growing louder," opposition Democratic Party leader Katsuya Okada said shortly before the vote, according to the Guardian. "Prime Minister Abe, you should admit you have not obtained the people's understanding and immediately withdraw the bills." If the upper house votes down the legislation or fails to vote within 60 days, it will be sent back to the lower house for a final say. However, Thursday's approval virtually guarantees enactment of the legislation into law because the more powerful lower house's decision overrides the upper chamber's vote. China has also responded to the news, urging Japan to "refrain from damaging China's sovereignty and security interests."